Mandy Lau won a Ci2016 Innovation Leader Scholarship! Mandy Lau (VIC) is Founder of Reach & Match, an innovative education kit to empower children with vision impairment/complex needs, also provides an inclusive learning solution in mainstream settings. 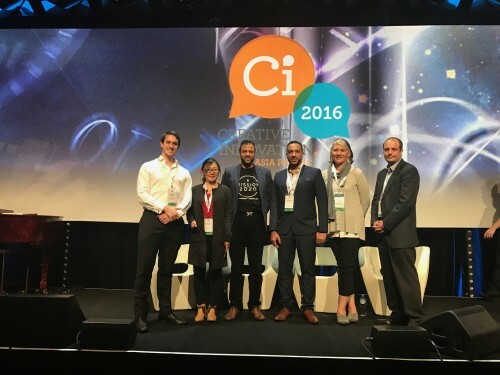 Mandy is one of the nine Australians have won the opportunity to present their innovations to the world’s elite business thinkers and leaders at Creative Innovation Asia Pacific 2016 as recipients of the Ci2016 Innovation Leader Scholarships. The Creative Innovation Global scholarships are provided to emerging leaders to prepare them for the challenges of tomorrow and help them access key decision makers across society and the economy. Creative Innovation invites applications from emerging leaders, innovators, social and for-profit entrepreneurs to win one of ten scholarship places to Creative Innovation 2016 Asia Pacific, with the theme, “The Exponential Shift: Making Transformation happen”. Ci2016 brings together some of the world’s most important thinkers to share strategies, solutions and best practice. Its focus is leadership, innovation, education, technology, entrepreneurship and science and features a program of 13 Master Classes, Deep Conversations, two action-packed conference days, a Gala Dinner, Artists-in-Residence and networking opportunities. Creative Innovation Global is now regarded as the leading innovation event in the Southern Hemisphere having won Corporate Event of the Year in the global Eventex Awards and in the Australian Event Awards. Creative Universe founder and Ci2016 Executive Producer, Tania de Jong AM says the scholarship winners will be well received by event attendees for contributing innovative solutions in the race to the future. “The theme for Ci2016 this year is “The Exponential Shift: Making Transformation Happen” and our scholarship winners have embraced innovative thinking and creativity to bring their fresh ideas, leadership and courage to a range of challenging issues,” Ms de Jong said. Reach & Match is an innovative educational kit to empower children with special needs by developing essential childhood skills including cognitive, motor, social and communication skills. OpenIDEO & MIKTA EiE Challenge – Reach & Match Inclusive Education is kicked off in the Philippines! Reach & Match Won OpenIDEO & MIKTA EiE Challenge! Copyright © 2014-2018 Reach & Match Pty. Ltd. All rights reserved. Proudly Australian designed.